Ministry of Propaganda - 27/May/2006: "Scare in the Afternoon"
Not so great start to the bank holiday weekend: Earlier this afternoon I had a run in with the joggers best friend, also known as dog. I was almost at the end of my run when I passed someone walking their dog. Nothing unusual in that, happens pretty much every day, often several of them. When I was almost past the dog it suddenly ran to me and started jumping up. Not entirely sure if it was snapping as well. With the momentum I had as I was running I continued, impossible to stop that quickly. 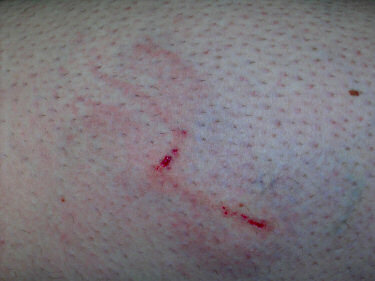 The dog continued to jump up my leg, possibly snapping as well. 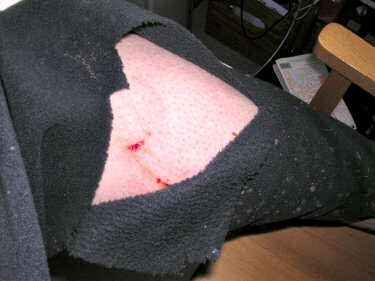 The owner was running towards me to grab the dog (it wasn't on a leash, as most of them aren't) when I realised that something was wrong: My jogging trousers had been torn open and I had a large scratch or possibly even bite on my leg. Luckily the bleeding stopped very quickly and it didn't look too bad. It wasn't hurting too much, more like a sting or an itch. I think the owner of the dog was more shocked and scared than me. She gave me her address and phone number and promised to pay for new trousers as well as asked me to call her with an update once I had been to the doctor. My doctor was closed, so decided to quickly drive to the local walk-in centre. If you have had all five doses of tetanus vaccine and your wound is not serious or particularly dirty, you are not at risk of tetanus and so do not need an additional injection of tetanus vaccine. Soon a nurse called (much quicker than the four hours) and after asking me a few more questions we agreed that I should be fine and wouldn't need an injection as the scratches were only superficial. She said to cover it with some plasters and watch it a bit, just to be on the safe side, and call again if I noticed any complications. Good thing though that I kept my "Impfpass" (a kind of immunisation passport most (or all?) Germans have), as that allowed me to confirm how many shots I had. So luckily only a scare and the need to buy some new jogging trousers on Sunday or Monday. And a dog which will certainly get some more education now. Phew.